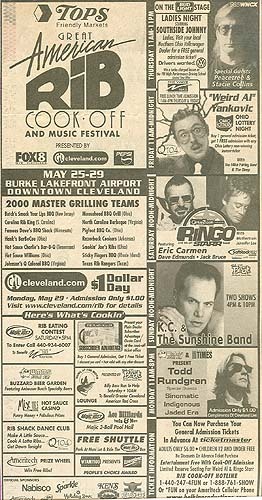 A print ad for Al's May 26, 2000 concert in Cleveland, OH. Strangely, even though the show was a part of Touring with Scissors, the ad uses an image from Bad Hair Day. At the bottom, the ad explains that all tickets are general admission with two very special exceptions: "Limited Reserve Seating for Weird Al & Ringo Starr."